Steve Harvey Surprises Carlos with Everything He needs as a New Dad! Everything He Needs as a New Dad! College Funds for Each Baby! JUNE 8, 2015 (CHICAGO) — Tune-in to “Steve Harvey” on Thursday, June 11 as Steve Harvey teams up with PEOPLE MAGAZINE for an EXCLUSIVE update with quadruplet dad Carlos Morales of Phoenix, Arizona. Carlos will get the surprise of a lifetime, when Steve Harvey sets him up with everything he needs as a new dad – including $10,000 from Sallie Mae for each of his children to start their own college savings account! 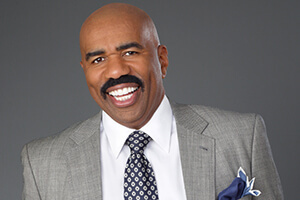 “Steve Harvey” airs weekdays. Check local listings or go to http://steveharveytv.com/ for time and channel. You might remember his story, featured exclusively in PEOPLE Magazine earlier this year (http://people.com/quadrupletdad). One of the happiest days of Carlos Morales’ life turned tragic after his wife Erica died just eight hours after giving birth to their quadruplets, Tracy, Erica, Paisley and Carlos Jr. Carlos’ wife was never able to hold or even see their four newborns. Carlos is now a single father, raising four babies on his own. “I feel thankful and blessed because each one of them has something in common with my wife, Erica.” Carlos tells Steve Harvey. After hearing Carlos’ story, Steve Harvey knew he wanted to do something to help. He enlisted show correspondent Kim Gravel (Lifetime’s “Kim of Queens”) to surprise Carlos at his Phoenix, Arizona home and gifted him with all of the necessities he needs as a new dad! “I don’t think anybody deserves it more,” said Steve Harvey. UPPAbaby: Four MESA Car Seats with their brand new VISTA Strollers (http://uppababy.com/). 4moms: Four mamaRoo Infant Seats and four Breeze Playards (https://www.4moms.com/). SVAN: Four Brentwood Highchairs (https://svan.com/). PLUM ORGANICS: A four-year supply of Plum Organics food for all four children (http://www.plumorganics.com/). BABYGANICS: A four-year supply of baby-safe personal care and household products for all four children (http://babyganics.com/).